Perfect for securely mounting a fan to the radiator. Made from Aluminium, these are laser cut with a 200mm long legs to suit each specific fan size from 7.5". Each kit is supplied with 2x Brackets, 4x M6 Nyloc Nuts & 4x M6 Washers. Perfect for securely mounting a fan to the radiator. 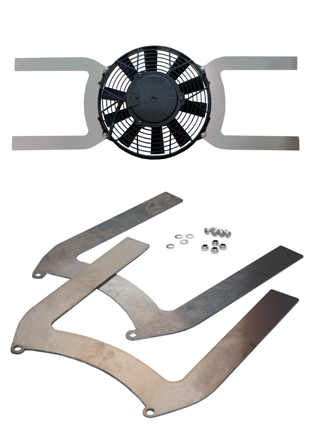 Made from zinc plated mild steel, these are laser cut with a 200mm long legs to suit each specific fan size from 7.5". Each kit is supplied with 2x Brackets, 4x M6 Nyloc Nuts & 4x M6 Washers.